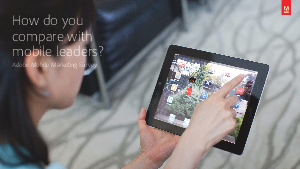 > Adobe > How Do You Compare With Mobile Leaders? With the explosive growth in smartphone and tablet usage over the past five years, most marketers have developed strategies to engage customers via mobile channels. This Adobe survey reveals how more experienced mobile marketers have learned to reach customers across devices and platforms and adapt their mobile investments as they mature. This research analyses the best practices among mobile marketers, from “experts” in the field to more recent arrivals. These professionals work in a variety of industries—media and entertainment, retail and commerce, financial services and B2B high -tech—and perform mobile marketing activities on a regular basis.